My title for today's post, "Autumn Days" is pretty much wishful thinking on my part! As a matter of fact, as I write this, we are getting ready for what will be soon be Hurricane Isaac. At this point it looks as if we will be getting lots of rain and possibly some wind. We have put away all the pool toys, lawn chairs and anything that looks like it might take flight! The forecast for our area is lots and lots of rain and thunderstorms over the next few days. I think we will be fine...wet...but fine. Don't forget to say a prayer for all those who will not be getting off as lightly. 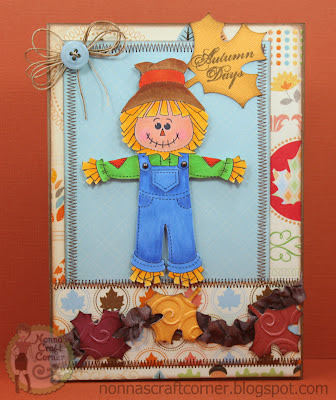 I just love scarecrows and this little guy is so, so cute! 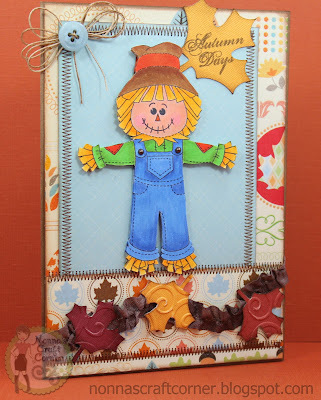 *Printed papers are from the DCWV paper stack "Autumn Splendor"
*Scarecrow - Peachy Keen - "Faceless Scarecrow Dolls-Large"
* Face - Peachy Keen - "Monster Mash Face Assortment"
* Leaves were embossed with "Divine Swirls" embossing folder. Well, that's my card for today! I need to get busy and get supper on the table. I hope to have another project to share with you in a few days, but I'm thinking that may depend on the weather. I'm hoping that we don't lose power, but you just never know about these hurricanes! If you are anywhere in the path of this store, batten down the hatches and you will be in my prayers! This is such an adorable card! I love the fall colors you used and the details are amazing! Sending prayers your way for Isaac! I agree about the weather. We still have record heat and minimal rain. I'm ready for fall too.Your card is so cute:) Stay safe! To cute... love the image, the embossing on the leaves and the stitching. Super fall card. Y'all are in my prayers Tanya!! Stay safe!! And what luck to get the Teddy Bear Parade on cricut.com & with a $10 credit no less! "SCORE"! Fabulous card! Love all the stitching and the scarecrow is adorable! Stay safe and dry! Tanya, This is adorable. I love your coloring. Especially the overalls, the shading is so well blended. Love the leaves too. Really great card. What a GREAT card!! Love the adorable peachy scarecrow and great stitching!! This is such a cute card!! I love your scarecrow and the embossed leaves!! Stay safe!! One year ago today, the remains of hurricane Irene came through our valley here (in upstate NY!!!) and destroyed our church and over half of the homes in our town! So we know that even those not in the worst line can be hurt!! Tanya, what a lovely card, you made this Peachy scarecrow look just darling! I hope you're staying safe and Issac passes you right by!! Oh wow, this is so fabulous!! The scarecrow is too cute!! I love the stitching and the leaves!! What a fun card!! Stay safe and I hope the storm doesn't hit. So cute!!! Love the leaves and stitching! Tanya ~ Oh my this is just way too CUTE! I just LOVE how you colored the scarecrow! Your paper choices and the details are just AMAZING! I hope you all are okay and Issac wasn't to mean to you all! Adorable scarecrow!!! Glad you guys were spared from the hurricane!